You’ve made an excellent choice by choosing hardwood! Now the next step is creating a plan. Being prepared will create less stress for you — and your installer! Installing hardwood floors is an art. Go with a professional who can guarantee a beautiful, efficient and correct installation. It will pay off in the end. 1. Nail Down Hardwood: 3/4" solid wood strips or planks are typically installed by using 2” nailing cleats, a wood flooring nailer and a mallet to attach them to a subfloor. Adapters are available for thinner products, as well. 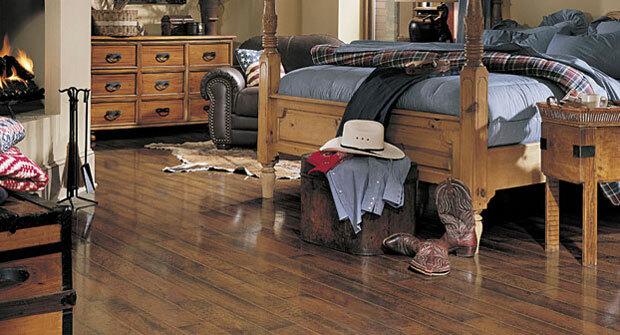 Solid strips and planks can only be nailed to wooden subfloors on or above grade. 2. Staple Down Hardwood: With this method, 1-1/2 to 2 inch staples are used to attach the wood flooring to the subfloor. A pneumatic gun drives the staples into the hardwood and subfloor. Not all wood flooring manufacturers recommend the same staple gun, so hiring professional installers will help guarantee that the right staple gun and right size staples are used. 3. Glue Down Hardwood: Here, adhesive or a natural resin (called “mastic”) is spread with the proper trowel to adhere your hardwood to the subfloor. This technique is typically used to install engineered and parquets since solid strip and plank floors can only be nailed or stapled down. There are a number of adhesives on the market. Your installer will use the one recommended specifically for your flooring. Failure to use the manufacturer’s recommended adhesive and trowel size could void any warranties you may have. 4. Floating Hardwood: With this technique, your hardwood floor is not mechanically fastened to any part of the subfloor. A thin pad is placed between the hardwood and the subfloor. Then, recommended wood glue is applied in the tongue and groove of each strip or plank to hold the pieces together. A floating floor offers fast and easy installation and has its advantages. It’s protected against moisture; it reduces noise transmission; it’s softer underfoot; and it provides for some additional "R" value. Some engineered floors and all Longstrip floors can be floated.